While our behaviour change and technical trainings are in full swing, our global advocacy is also starting to bear fruits by entering international policy discussions. To reinforce its work and to promote discussion and sustainable use of biodiversity in agriculture, fisheries and forestry, FAO launched a Biodiversity Mainstreaming Platform in 2017. As one of its first activities, the Multi-Stakeholder Dialogue on Biodiversity Mainstreaming across Agricultural Sectors, jointly organised with the Convention on Biological Diversity (CBD), took place at FAO Headquarters in Rome at the end of May 2018. It brought together stakeholders from governments, research, intergovernmental and nongovernmental organisations and the private sector to discuss current biodiversity mainstreaming efforts and the way forward. We were honoured to be invited as speaker to this high-level UN event and showcase some of the solution s based on voluntary certification schemes. The informal character of the Dialogue allowed for engaged and rich debates, demonstrating the willingness of the different stakeholders to understand each other’s point of view. Based on the lessons learnt from the solutions surfaced, conclusions and recommendations for policy makers were compiled in a policy brief, which participants of the dialogue showed great interest in. These lessons are based on a global crowdsourcing effort led by a jury of over fourty experts that surfaced 300+ unique and proven ways in which agriculture and biodiversity already work hand-in-hand at the local level. Go here for all our recommendations. We have channelled these messages into the global consultation on ‘Mainstreaming biodiversity in agriculture, fisheries and forestry for improved food security and better nutrition‘ (see our input starting on page 75 of the Proceedings). Gabor Figeczky representing Farming for Biodiversity at FAO. 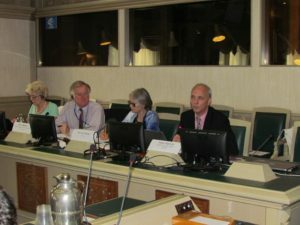 Delegates concluded that transformative changes are needed to produce healthy and nutritious food while simultaneously safeguarding the planet’s biodiversity. 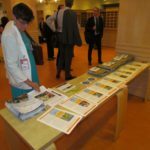 Biodiversity mainstreaming will be considered in 2018 by FAO Regional Conferences, Technical Committees, the CBD COP 14 and the FAO Conference in 2019 and we will keep bringing the lessons learnt from our project into these discussions.